Atlantic Coast K-9 Training Service was founded in 1999 by Ralph Smith. Ralph has been a dog owner his entire life. He got his initial start in dog training in 1991 when he became a member of Dogs East Search and Rescue. He spent 2 years there working with what he considers some of the top dog professionals in the country and credits much of his training foundation to the skills he acquired there. Unfortunately, his search dog, a beautiful Doberman Pinscher named “Rocker” was tragically killed and he decided to take a break from training to regroup. It took a couple of years to get over the loss of his dog but during the time off, he developed an intense desire to become a Professional Dog Trainer. Not just any trainer though, he wanted to become recognized as one of the best in the world. He began that process by going to school at North State K-9 Academy (also called Tarheel K9) in Sanford, North Carolina where he had the opportunity to work with world renowned trainer Jerry Bradshaw. The experience there was incredible but that was only the beginning. In the years that have followed, he has had the opportunity to attend one on one workshops with the likes of Bart Bellon, Dean Calderon, Michael Ellis and a long, long list of many others. Chances are, if they are accomplished Dog Trainers, then Ralph has either worked with them or studied their methods. Despite the tremendous amount of knowledge and training skills that Ralph has garnered over the years it has always been important to him that he didn’t become a copycat of any one particular trainer or style. Instead, he wanted to create his own niche in the training world. After more than 25+ years as a professional trainer he has gained the respect of his peers as well as his customers as being among the top trainers in the United States. 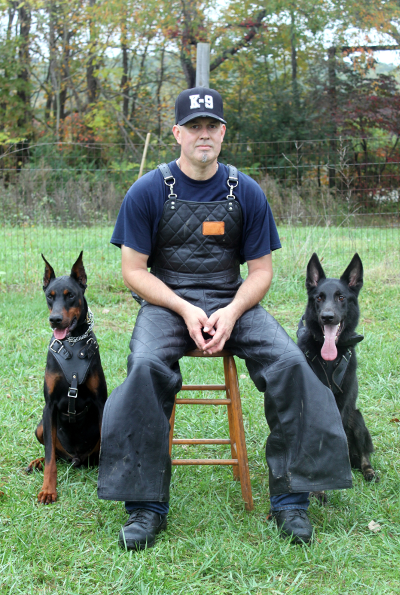 His accomplishments as both a Professional Dog Trainer as well as a National Level competitor in Working Dog competitions is becoming legendary. Ralph Smith gives seminars nationally on Dog Training at every level as well as seminars on Pet Nutrition. If you are fortunate enough to have the opportunity to attend, it is an informational opportunity that you don’t want to miss. As for training of your dog, there are few better. Folks from across the country bring their dogs to Ralph to have trained. If you are looking to get your dog to a level that you never imagined possible, whether it be a well behaved family pet or a World Class Competition dog, look no further!